cannabis breakthrough? Charles Kennedy, leader of Liberal Democrats supports the right to grow your own. THE Cannabis Trust has published two letters from Charles Kennedy, leader of the Liberal Democrats, in which he supports the right to grow your own cannabis and says he will seek to put "the supply of cannabis on a legal, regulated basis." This is a major advance on his parties previous 'sitting on the fence' policy. The two letters, written by Charles Kennedy to a member of the public, show how the Liberal Democrats have moved from just calling for a 'Commission of Enquiry' on drugs, to laying out a viable plan to "break the link between cannabis use and organised crime" by essentially legalising it "subject to securing necessary re-negotiation of the UN Conventions"
The increasingly popular Lib Dem leader Charles Kennedy, writing in a letter dated August 11 2005, published by the Cannabis Trust says; "it is not in the public interest to prosecute individuals for possession of cannabis for their own use, cultivation of small numbers of cannabis plants for their own use, or social supply of cannabis." He says the Liberal Democrats will be "seeking to put the supply of cannabis on a legal, regulated basis, subject to securing necessary re-negotiation of the UN Conventions". But in typical liberal fashion he warns it would be "unrealistic to expect this to happen quickly". However the Cannabis Education Trust has analysed the 'Bible of Prohibition' otherwise known as the 'UN Single Convention on Narcotic Drugs 1961' (pdf), which was ammended to make it even worse in 1972. The Trust says: "Charles Kennedy may not be aware that any party to the UN Convention may legally withdraw from it on six months notice". The Cannabis Trust analysis of the UN Convention says that: "The commonly used argument that if Britain did this, it would lead to a breakdown in the international system of control of opiates, or even prevent the UK from obtaining opiates for legitimate use, is simply not true. The reality is the system of control is applied to every country in the world whether it has signed the Convention or not. The International Narcotics Control Board is specifically authorised to do this by Articles 12, 13, 14 and 21 of the Convention". This view is backed up by the 'Canadian Foundation for Drug Policy'. whose extensive analysis of the UN convention concludes: "Canada, as a party to the Single Convention, is not required to treat possession of cannabis products for personal use as an offense, or to impose criminal sanctions on such conduct even if it does choose to maintain a criminal prohibition". Adolph Lande, who as 'Deputy Executive Secretary of the Plenipotentiary Conference', acted as chief draftsman of the Convention agrees: “.... unauthorised possession and acquisition of narcotic drugs for personal consumption need not be treated under the Single Convention either as punishable offenses or as serious offenses”. The U.N. Convention even says that people can smoke 'proper weed' (ie the whole plant) legally, but not just the buds on their own (which is also what a lot of Rasta people say): "The prohibition on non-medical use of drugs does not extend to cannabis leaves, and the prohibition of cultivation of the cannabis plant does not extend to cultivation for any purpose which does not involve the separation of the flowering and fruiting tops, or the resin, from the rest of the plant. (A Lands The International Drug Control System in Drug Use in America: Problem in Perspective, Appendix, Technical Papers, Vol III, p 129.)". 'News of the Weed' says: Charles Kennedy's heart and soul are obviously in the right place to be a great leader, now he needs to get his parties brain into gear. They need to stop hiding their light under a pile of papers, and come out hard for a program that seriously addresses Britain's spiraling drugs & booze crisis. They know this involves legalising cannabis, and being honest about corruption. But Lib Dems should watch out: There is an outside to good chance that the Tories may do the clever thing and elect David Cameron (pictured above) as their leader. 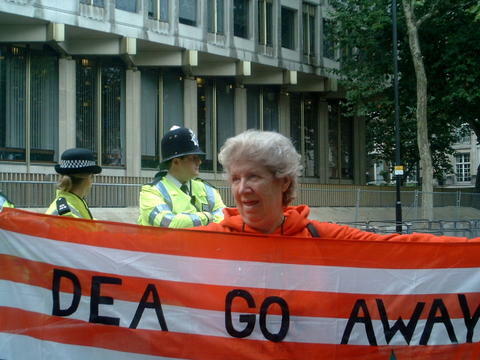 He told the Independent recently that the UN should consider legalising drugs. He said he favoured a "fresh thinking and a new approach" toward British drug policy, adding "we have to let 1,000 flowers bloom and look at all sorts of treatment models" for heroin addicts. Could this include growing weed and giving addicts ibogaine? If they stay too fluffy the Liberals could even be left out of the looming cannabis vote bonanza. This would be a shame because Charles Kennedy is a better man than any Tory, the Milk Snatchers Party. 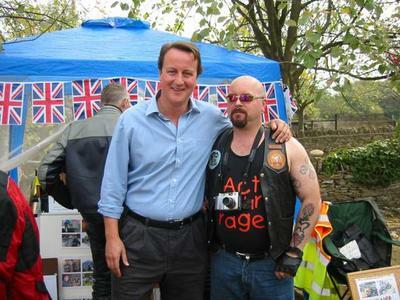 David Cameron may be playing 'hip' to the street, he may hug Hells Angels, but he is still a member of the party that stopped free milk for school kids and sold the family silver. Wikipedia has an extensive section on the Single Convention. A DESTRUCTIVE but very legal 'wrench' has been thrown into the carefully laid DEA plan to kidnap 'Prince of Pot', Marc Emery and two other Canadians (pictured right), and put them in an American concentration camp for selling cannabis seeds by mail order. David McCann, a Canadian philanthropist and businessman has announced that he has hired prominent lawyer Peter Leask to file three charges of conspiracy under the 'Controlled Drugs and Substance Act' and the 'Criminal Code of Canada' naming Marc Emery and his two associates. Quoted in the Canadian Press McCann said "If he gets charged in Canada that will have major legal consequences for that extradition request." "Canada has been hypocritical in allowing Emery to sell marijuana seeds and collecting thousands of dollars in taxes while the city of Vancouver gave him a business license for his pot paraphernalia store"
"We have let him operate and now we let the Americans walk into our country and charge a man who they will probably lock away for the rest of his natural life in the United States for doing something that the government of Canada condoned. And you know, I got a problem with that as a Canadian." "He broke the law in Canada and so if we are going to let him be charged he should be charged here, where he did the offense," said McCann, adding he's never met Emery. McCann noted that Health Canada even referred patients, many of them terminally ill, to Emery if they wanted medicinal marijuana. McCann, who now runs an art shop, hit the headlines in 1990 as a crusader against sexual abuse who triggered one of the largest sexual abuse investigations in Canadian history. He told Vancouver's '24 Hours' that now he wants to spark a national debate on Canadian sovereignty and drug policy. Kirk Tousaw, one of Emery's lawyers, said it's possible that the United States' attempts to extradite his client would be thwarted. That's because Section 47 of the Extradition Act says the justice minister has the discretion to refuse extradition if he's satisfied that the same conduct is the subject of criminal proceedings in Canada. Emery, leader of the Marijuana party in British Columbia, said he sees McCann's private prosecution attempt as something positive because he's always felt he should be charged in Canada for his activities. "His intent is to stop the extradition and have me charged under Canadian law in a Canadian courtroom," Emery said. "I'd much rather be in front of a Canadian jury in a Canadian court. It'd probably still keep me out of the seed business for the rest of my life, alas, but it certainly would lay people's fears of a sovereignty intrusion to rest." 58% of Canadians said they were against the extradition in a poll after the kidnapping proceedings were started by the DEA at the end of July this year. At the beginning of September there were international protests in 40 cities including London and every Euro MP was given a bag of seeds and a strongly worded but polite protest letter.